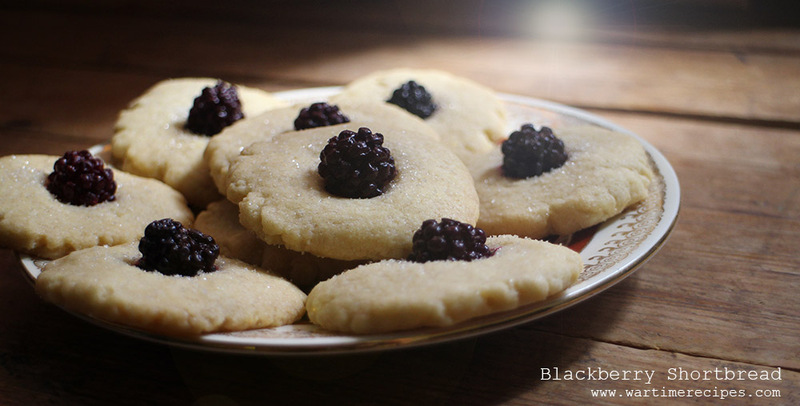 I’m picking wild blackberries in my garden every couple of days so today when I found a simple shortbread recipe in the ‘Eating for Victory’ book (a collection of reproduction WW2 instructional leaflets) I immediately decided the shortbread biscuits would need a blackberry on top to give them an extra a burst of flavour. Let me tell you…the blackberries worked so well! It will take me a LOT of willpower to not devour all of them! So the recipe is incredibly simple and I didn’t even use a rolling pin and a biscuit cutter. Rub the margarine into the flour and sugar. Knead into a dough without adding any water. Roll out to about 1/8th inch and cut into biscuits (I simply tore off a walnut sized amount, rolled into a ball and flattened it in my palms and dented the middle once on the baking tray to place the blackberry). Sprinkle with a little sugar. Bake in a cool oven (about 150 c) until very pale golden brown around edges. Here are some photos I snapped with my phone of the process.. 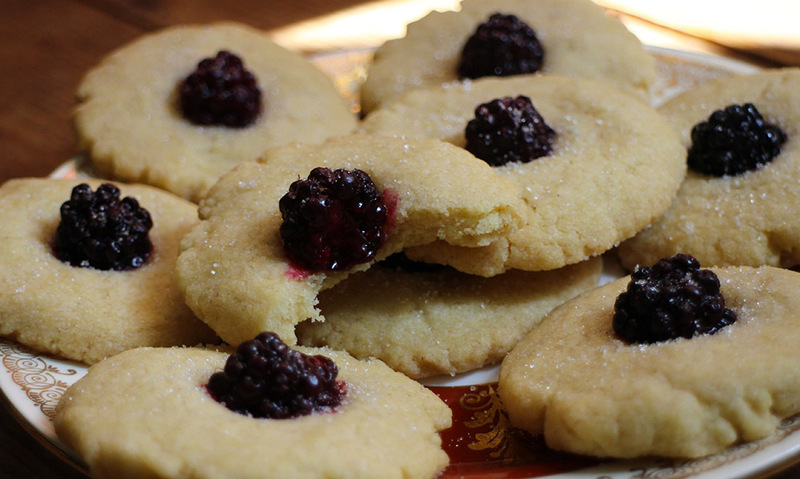 This entry was posted in recipes and tagged blackberry shortbread, rationing, shortbread, ww2. Bookmark the permalink. ← Back to Rationing – Day 1. What I Ate. G’day 🙂 Wow, gorgeous blackberries. Lucky you to have them in the garden. Blackberries here in Australia are considered a noxious weed and vigorously poisoned along the roadsides. Such a shame they’ve never been promoted as “come and pick all you like”. Berries just aren’t the thing here that they are in UK, except strawberries, seeming to prefer tropical fruits. I suppose that’s to be expected, but boy do I miss the berries! Buying them is astronomical and a true luxury. Your biscuits look scrummy. It’s a luxury I’ll have to indulge in I think. Thanks. https://polldaddy.com/js/rating/rating.jsThese look yummy! I’m so glad you’ve decided to post again. I’ve got to get back on track with my eating/cooking/weightloss habits myself, and your posts always provide inspiration!